The 2017 NFL trading deadline has produced some rare, and welcome, activity. We usually remark at this time of year about the presence of a lot of smoke but no fire in potential trades involving well known and/or accomplished players. And it has always seemed that while the NBA and Major League Baseball have created a buzz around “buyers and sellers” in the stretch run, the NFL has never wanted late-season trades to tip the competitive balance scales as they do in other leagues. During my time with the Packers, general manager Ron Wolf and I drafted a couple of unsuccessful proposals to facilitate trading. We first proposed pushing the deadline to much later in the season—the Tuesday after Thanksgiving—to create some buzz and allow for action between “buyers” and “sellers.” In denying that proposal, the NFL said it wanted to discourage the “rent-a-player” strategy of baseball teams in stretch runs. Another reason traditionally given for the absence of NFL trades is that, unlike baseball or basketball, players don’t move seamlessly from team to team due to the schematic nature of the game. As I have seen firsthand, football coaches love their schemes. And coaches are constantly complaining about the CBA restrictions on offseason practice in getting players to learn and get accustomed to those schemes. Now almost six years into the CBA, coaches should be adapting to limited time with players, an adjustment that can prepare them for acquiring a player midstream at the trade deadline. That was then; this is now. By Monday night there were three trades involving high-level players and/or draft picks, trades that we are used to seeing in basketball and baseball at the trade deadline. Tuesday morning brought another significant move. Let’s take a look at potential reasons why this change this year. When a player is available for trade or as a free agent, my immediate question—as most general managers in the league—is “What’s wrong with him?” The NFL is a small world, and relationships matter; no team is going to “get over” on each other and hide a players’ deficiencies, whether on or off the field. And with better relationships among teams, advanced analytics, ample cap room and reduced ability to hide information, there are no secrets anymore. Thus, teams rarely find “good value” in trades due to players being unloaded. The trades this week reflect that. The Eagles’ Howie Roseman and the Dolphins’ Mike Tannenbaum are as close as any two general managers in the league. I know this firsthand; Howie, Mike and I came up through the ranks together as cap managers many years ago. Roseman and Tannenbaum pulled off a trade last spring, with the Eagles moving up five spots in the draft in exchange for Byron Maxwell and Kiko Alonso, paving the way for Carson Wentz’s arrival in Philadelphia. That relationship was crucial in the Eagles trade of a fourth-round pick to the Dolphins for Jay Ajayi. The compensation sounds low and some will ask the question “What’s wrong with him,” but again, there are no secrets in this league, especially between these two. The Jaguars acquired Marcel Dareus from the Bills, a player once, and perhaps still, thought to be a dominant defensive tackle. Dareus received one of the more stunning contracts in recent memory, as Buffalo gave $96 million over six years, including a $25 million signing bonus, to a player who had had off-field issues (as I have learned, more money doesn’t solve issues, it exacerbates them). The Bills moved Dareus and took on a massive $14.2 million of dead money (he will probably be the highest cap charge on the team in 2018) in exchange for the bargain price of a low-round draft pick. Both sides knew what they were getting, as reflected in the compensation given. Similarly, it was no secret that Duane Brown was trying to get out of Houston for some time, holding out for the first seven weeks of the season before showing up and playing against Seattle, the team now acquiring him. My immediate reaction to the trade was to wonder if there was a companion negotiation on Brown’s contract, the one to which he protested by holding out from the Texans. If not, it shows that Brown’s issues with the Texans were much deeper than something an upgraded contract could solve. And, of course, those issues were certainly exacerbated by owner Bob McNair’s comments from last week. Knowing all of this, kudos to Texans management for extracting cornerback Jeremy Lane, plus a fifth-round pick in 2018 and a second-round pick in 2019 for a player who, as everyone knew, didn’t want to be there. A final note on the Brown trade: Russell Wilson is a beneficiary here in more ways than one. Besides now being protected by a top-echelon tackle, Wilson improved his cash flow as a result of the trade. At the request of the team, he converted $6.26 million in salary to bonus, thereby prorating the amount for cap purposes over the three remaining years of his contract and creating the necessary cap space ($4.1 million) to acquire Brown. As added consideration for this paper transaction, Wilson will receive that $6.26 million immediately in the form of a bonus, rather than as scheduled through the next two months. It is a good week for Russell Wilson. As to the 49ers’ acquisition of Jimmy Garoppolo, much has been written about it, but it again raises the question of whether the 49ers had companion negotiations about an extension of Garoppolo’s contract in conjunction with the trade negotiations to get him from New England. Without that, they are sending a second-round pick in next year’s draft, perhaps No. 33 or 34, for a player who may not be with them at the time of the draft. True, the team can engage in negotiations with his agent at any time, but the leverage exists at the time of the trade. With no deal, the leverage shifts to Garoppolo. The 49ers will keep trying to get their quarterback position right. Over the past eight months they have told Colin Kaepernick he would not be welcome (Kaepernick opted out before the team opted him out), drafted C.J. Beathard in the third round, and gave up a second-round pick, one that will be very high, in next year’s draft. 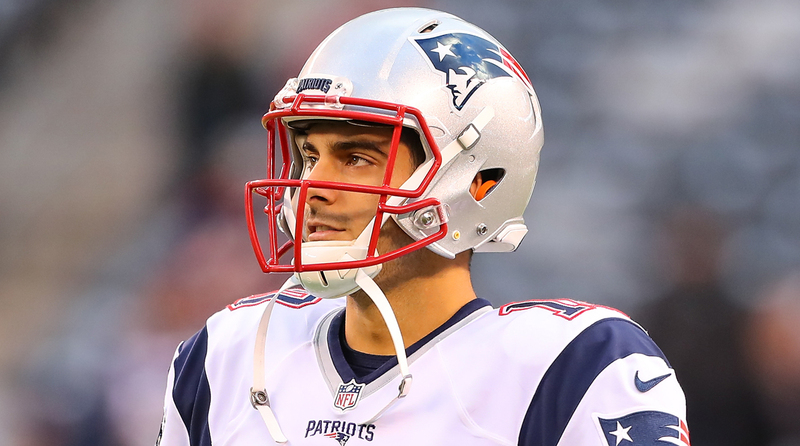 A lot is riding on Garoppolo. A trade deadline with some buzz? This is not your father’s NFL. On McNair’s comments and his subsequent throwing league officials under the bus to (unsuccessfully) move the conversation away from the players, well, I am a bit surprised at the surprise. In case you haven’t been paying attention, NFL owners have become quite used to having their way with networks, sponsors, ticketholders and, especially, players. One only need look at the current CBA and the business model of nonguaranteed contracts to understand how the NFL views its labor force. I understand the players’ emotions that were evoked from McNair’s comment; I hope, for their sake, they are able to use that energy and commitment of purpose at the bargaining table. As for Goodell, as I continue to be told about the subject, the holdup on his contract extension centers on the structure of the deal, not whether it will happen. Jerry Jones, the bandleader for much NFL policy these days, has led the charge for more incentive-based compensation rather than simply rewarding Goodell with a number. With key markers ahead such as new media rights deals and CBA negotiations, it makes obvious business sense to incentivize Goodell based on such important metrics ahead. The structure also represents a realistic and measured compromise between (1) owners who want to pay Goodell a guaranteed amount without having him “earn” some of it and (2) owners—although I am not sure if there are any—who would rather he not be extended. NFL owners negotiate incentive-laden contracts with their business partners and their players all the time. It makes perfect sense for them to want to do the same with their commissioner. As I’ve said for months regarding the Ezekiel Elliott legal wranglings, we are back to where we always return: the CBA. Elliott won a couple battles, and there is a small chance he will win another, but he will lose the war. Courts give too much deference to arbitrators in collective bargaining situations for the NFLPA to win these cases on appeal, even with suggestions of “fundamental unfairness.” Sure, it is not a good look that the NFL did not listen to an investigator who questioned the credibility of Elliott’s accuser, but that does not tip the legal scales concerning a CBA process agreed to by the union. The NFL filed in New York to confirm the suspension knowing the precedent from the Tom Brady case would be controlling. And, of course, the judge referred to Brady precedent prominently in reinstating the Elliott suspension. So where are we? The same place we have always been with commissioner power and player conduct: a reaffirmation of CBA power—and tens of millions of dollars of legal fees in the wake. Should or will the NFLPA try to change this in the next CBA? Well, add it to the wish list, though there’s not a lot of ammunition to give in exchange. • SIGN UP FOR THE MMQB NEWSLETTER. Get “The Morning Huddle” delivered to your inbox first thing each weekday, by going here and checking The MMQB newsletter box. Start your day with the best of the NFL, from The MMQB.